The best holiday scenes in novels are sometimes unexpected. 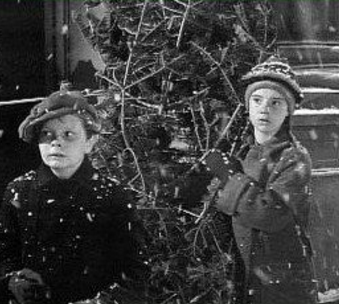 While some of these scenes may seem incidental, the Christmas tree scene in Betty Smith’s A Tree Grows in Brooklyn (1943) is anything but ancillary. Smith uses the sentimentality of Christmas to highlight the novel’s theme of tenacity. Smith’s protagonist is the 10-year-old Mary Frances “Francie” Nolan, who is determined to rise above challenging circumstances of poverty, social class, and her father’s alcoholism. Coming of age novels like A Tree Grows in Brooklyn are good choices to use with students, but educators may be dissuaded from assigning the novel as a whole class read because of its length (443 pages). The reading level (Lexile), however, is 810, a reading level appropriate for readers grade 5 and up, although some of situations and language are more suited for grades 8 and up. With all the attention to the practice of “close reading” to improve comprehension, it is possible to have students read a single chapter, such as this Christmas chapter (Ch. 27), independent of the novel. Sharing this chapter can help students appreciate Smith’s storytelling. For purposes of brevity, the text has been truncated into sequential sections below along with four questions that educators can use. So what does Smith “say” in the opening of the chapter? 2. What interesting or unusual words does Smith use is explaining Francie’s challenge ? 3. How does the Smith play with language in the following section? ‘Aw g’wan. You’re too little,’ the tree man objected. ‘Me and my brother-we’re not too little together.’ She pulled Neeley forward. The man looked at them a thin girl of ten with starveling hollows in her cheeks but with the chin still baby-round. ‘Two ain’t fair,’ yelped Punky. The others made a wavering lane… a human funnel with Francie and her brother making the small end of it. The man flexed his great arms to throw the great tree. He noticed how tiny the children looked at the end of the short lane. 4. So, what does Smith want the reader to understand? Students cannot help but admire Francie’s tenacity in confronting the physical force of the tree. Her determination is so powerful that she stands for two, “pulling him [Neeley] up fiercely” and standing “hand in hand”. Francie wins the great tree and as she drags the enormous prize home with Neeley, they are cheered on by well-wishers from the neighborhood. In reading this chapter, students may want to continue to read about Francie, who will, unlike the great tree, not be a prisoner of the tenement…her determination stands.